Chandelier Stakes 2014; Could Be Springboard to BC Juvenile Fillies Win: The Chandelier Stakes (G1) was introduced as the Oak Leaf Stakes in 1976. In it’s years, the Chandelier has seen the likes of Serena’s Song, Bold n’ Determined, Halfbridled, Stardom Bound, and Blind Luck. These fillies have gone on to accomplish some very valuable things, and some very prestigious races. The 2014 Chandelier is a race on two paths to success. First up, the Chandelier serves as a “win and you’re in” race to the Breeders’ Cup Juvenile Fillies on November 1st at Santa Anita Park. Any filly who wins this year’s Chandelier gets a paid entry and guaranteed spot in the Santa Anita starting gate. Second in line, the Chandelier serves as Road to the Kentucky Oaks race. The first four finished gets points toward a possible start in the 2015 Kentucky Oaks. The winner gets 10 points; the second place finisher gets 4 points, third place gets 2 points, and fourth place gets 1 point. The Chandelier (G1) has actually served a very good prep race for the Breeders’ Cup Juvenile Fillies. 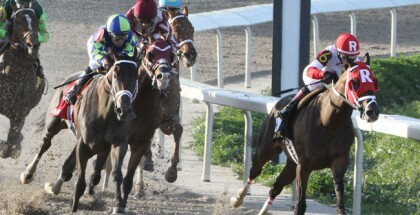 Race mares such as Stardom Bound, Sweet Catomine, and Halfbridled, all won the Chandelier-BC Juvenile Fillies double. A few have also pulled the Chandelier-Kentucky Oaks double, such as Blind Luck and Bold n’ Determined. Who is in this year’s Chandelier that really stands out? Could any of these fillies go on to pull either of the famous doubles? 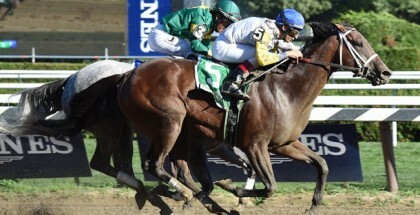 Angela Renee, pictured above in New York, is the morning line favorite with 3-1 odds in the Chandelier Stakes at Santa Anita Park on Saturday, September 27, 2014. While there is no exciting standout in the Chandelier field, there are some stakes and graded stakes placed fillies, and one stakes winning filly. Sharla Rae won the Barretts Debutante last out at Los Alamitos. The race was run 6 ½ furlongs on the main track. This filly, by Afleet Alex, is increasing her distance slowly. She broke her maiden at 5 ½ furlongs. This will be the longest she has run, but her pedigree says she can handle it. She hasn’t recorded a work since September 6th. Sunday Sonnet is stakes placed. She did finish finish second in the P.G. Johnson Stakes, on the grass. Her pedigree does suggest she would prefer synthetics or turf, but she could adapt to dirt. She did break her maiden at second asking, going 7F. Conquest Eclipse is one of two graded stakes placed fillies in the field. She was 3rd in the G1 Del Mar Debutante, after breaking her maiden at 6F. She should enjoy the stretch out, as her sire is the stamina sire Malibu Moon. She is working decently at Santa Anita. Angela Renee has a lot of weight her shoulders. She is a full sister to stallion To Honor and Serve. She has proven she has the talent. 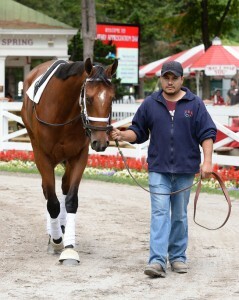 She broke her maiden at 5F before finishing 2nd in the G2 Adirondack and the G3 Spinaway. She is working decently at Belmont. There are two maidens in the field as well. The Curlin colt Danette is improving as she gets more experience. She was second last out, in her fourth start, by a head. She does need more distance, as her pedigree leads anyone to believe. She was 2nd in that 8F maiden special weight by a short head. Is the 8.5F what she needs to final graduate? Dad’s Princess is the other maiden in the field. She was 4th in the Del Mar Debutante last out. She has the pedigree to go long, as she is by Mineshaft, out of the Deputy Minister mare Rooney’s Princess. If that name slightly rings a bell, it is because she is out of the champion Princess Rooney. Dad’s Princess has a lot to do to step up here. Her works are not very impressive. The rest of the field, Manahatta, Maybellene, Cruising Harbor, and Morning Coffee are making their stakes debut here. All are working okay at their bases of Santa Anita, San Luis Rey Training Center (Cruising Harbor), or Fairplex (Morning Coffee), and should make a good showing, if they have prepped well enough. 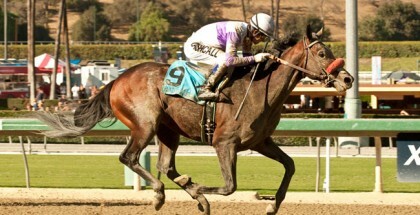 Are any of these fillies the next Breeders’ Cup Juvenile Fillies winner? What about the 2015 Kentucky Oaks winner? No one will know until November 1 and May 1.